The following post is written by Bella Brown, a YWA delegate. On the 4th September, I was lucky enough to attend and participate in an event at the House of Lords on child widows. The event was chaired by Baroness Anelay, and interesting knowledge was shared from esteemed and erudite speakers, such as Caroline Ford, the chief executive of the Consortium for Street Children, Matt Jackson, Director of the UK Office of the UNFPA, Heather Ibrahim-Leathers, CFA, President of the Global Fund for Widows, and Zarin Hainsworth OBE. Due to the varied perspectives from the panelists, including myself and two other delegates from the NAWO Young Women’s Alliance, a productive and inspiring discussion was had about best practice surrounding child widows. Caroline Ford’s knowledge of the plight of street girls and how their experience is so strongly linked with the plight of child widows offered both a new insight into the connection between homelessness and child widowhood, as well as solutions in dealing with this pressing issue, through firstly educational initiatives, secondly access to health services, and thirdly through addressing stigma, with all of these solutions aiding both street children and child widows. Matt Jackson spoke about the human rights violations faced by child brides, and strategies to end child marriage. He suggested a holistic approach – seeing the issue as two-faceted and not isolated from other areas. Therefore, his calls for action involved data, specifically disaggregated data, dealing with triply disadvantaged child widows – who firstly suffer through marriage as a child, the loss of childhood herewith, and then in widowhood, with a life ahead that often involves discrimination and alienation within the community. Matt also raised how in humanitarian settings, girls should be at the centre of the humanitarian effort. Finally, he raised a point of economic rationale – how ending the practice of child marriage would save billions of dollars, including on welfare. Heather Ibrahim-Leathers brought to the room inspiring conversation regarding the work of the Global Fund for Widows. She outlined how radical indoctrination, violence and food insecurity are perpetuated by widowhood, and I was specifically alarmed to hear that 40% of all extremists in Africa come from widowed households. Heather then explained how the Global Fund for Widows empowers widows. They work at grassroots level; finding data, which then improves intervention. 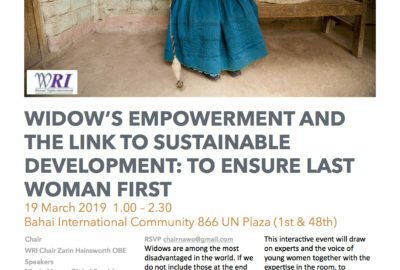 Following this, they train the widows they are helping in a field of their choice, leading to economic empowerment through an increase in income and establishment of savings. Zarin Hainsworth added powerful closing comments from the perspective of Widows Rights International, which summarized and concluded the session. An important discussion had during the meeting focused on the importance of language and disaggregated data. It was suggested that governments could collate data from grassroots organisations, due to the individual organisations often having useful, in depth data, which could provide a strong database. Another suggestion was the monitoring of census, as they may not be recording data from all citizens, and the intentions of the government must also be considered. Finally, a general recommendation of CEDAW was suggested, as the language within CEDAW remains very strong. Overall, the event was fascinating and inspiring to attend, and it was a wonderful opportunity to sit alongside so many respected panelists, with such an abundance of insight and knowledge to share and discuss.